Figure 1-7.Radiation balance in the atmosphere. Due to this differential insolation the tropical atmosphere is constantly being supplied heat and the temperature of the air is thus higher than in areas poleward. Because of the expansion of warm air, this column of air is much thicker and lighter than over the poles. 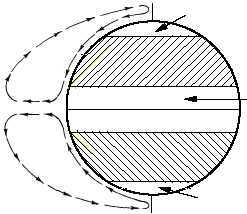 At the poles Earth receives little insolation and the column or air is less thick and heavier. This differential in insolation sets up a circulation that transports warm air from the Tropics poleward aloft and cold air from the poles equatorward on the surface. (See fig. 1-8.) Modifications to this general circulation are discussed in detail later in this training manual. This is the account of the total radiation. Some of the radiation makes several trips, being absorbed, reflected, or reradiated by Earth or the atmosphere. Insolation comes into the atmosphere and all of it is reradiated. How many trips it makes while in our atmosphere does not matter. 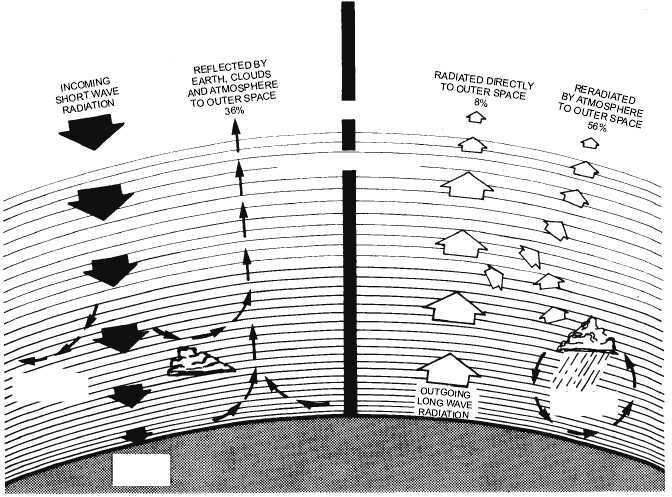 The direct absorption of radiation by Earth and the atmosphere and the reradiation into space balance. If the balance did not exist, Earth and its atmosphere, over a period of time, would steadily gain or lose heat. Although radiation is considered the most important means of heat transfer, it is not the only method. There are others such as conduction, convection, and advection that also play an important part in meteorological processes. 1-11 OUTER SPACE UPPER ATMOSPHERE AGf0107 NOTE: 36% OF INCOMING INSULATION INITIALLY REFLECTED 51% ABSORBED BY EARTH 13% ABSORBED BY ATMOSPHERE HYDROLOGIC CYCLE Figure 1-7.Radiation balance in the atmosphere. NORTH POLE SOUTH POLE EQUATOR AREA OF GREATEST INSOLATION AREA OF LEAST INSOLATION AREA OF LEAST INSOLATION AGf0108 Figure 1-8.Beginning of a circulation.